A current BMWCCA membership is required to participate in our HPDEs. Due to strong demand for space in National Capital Chapter (NCC) HPDEs, we are sometimes unable to accommodate all the students who apply. For HPDEs where applications exceed our school capacity, we will admit students as outlined below. Applicants that exceed our HPDE capacity or instructor load will be waitlisted. Students who sign up for a single day will be placed on the waitlist until it is confirmed that we have enough instructors for students signing up for both days. · All cars must be quiet enough to allow for in-car communication, must have passenger seats and equal restraint systems for both passenger and driver. Functional, securely attached lap and shoulder belts are required for both front seats. The front seats must have equal restraint systems in place and operational (e.g., if the driver has a five-point harness, the passenger must have a five-point harness as well.) Performance-enhancing modifications and R-compound (racing) tires inhibit learning and are strongly discouraged. If roll bars or cages are installed, they must be fully padded above the level of the front door window sills (anyplace the driver’s/passenger’s head could come in contact with the roll cage). · Cars must be inspected by a qualified service facility before the event. A properly completed tech inspection form (supplied) must be presented at the track. It is your responsibility to ensure that your car is safe and roadworthy. Race cars must present a current annual race car inspection. ATTENTION BMW E36 CAR OWNERS: The original radiator must have been replaced in ANY E36 BMW that drives in our schools. This is a safety issue and not negotiable. Download and read the Tech Inspection form on the NCC website (nccbmwcca.org) for the rules concerning you car. It is your responsibility to understand these rules prior to registration. If you wait too late and cannot meet the radiator requirement before the school, you run the risk of forfeiting part or all of your registration fee based on the Refund Policy noted below. Helmets ---Note these requirements --- Must be certified to Snell M- or SA-standards, 2010 or later. Full-face helmets with SA-2010 or later certifications are strongly recommended. The Snell Memorial Foundation’s certification will be found on a sticker inside the helmet. Loaner helmets are available on a limited basis. Contact the registrar to request a loaner helmet. Prior approval is required for students intending to share cars and for changes in car type after registration!! Student and instructor schedules are finalized and sent to the printer approximately fifteen days prior to the event. Our HPDE costs are fixed and based on financial obligations we enter into once you register and we accept you into the event. Tuition is priced as low as possible based upon your acceptance and attendance. If you cancel your registration two weeks before the Friday of the relative event, you'll not be charged for your registration. If you cancel your registration between 14 and 7 days before the relative event, you'll receive a 50% refund of you payment minus NCC incurred registration fees which are approximately 3.5%. If you cancel your registration within 7 days of the relative event, also known as the 'Freeze' date, you'll receive no refund. Registrations canceled after 5pm on the Freeze Date, will receive no refund. NCC incurred MSReg.com registration fees are the responsibility of the registrant/student regardless of the reason for the cancellation. Cancellation is the responsibility of the registrant and can be executed through MSReg. Notification to the Registrar may be made by email to registrar@nccbmwcca.org. 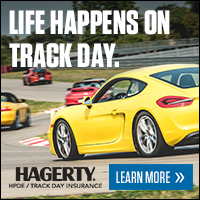 If you fail to attend the HPDE without notifying the Registrar prior to 5:00 p.m. the Friday before the event, you will forfeit your entire tuition for that weekend. If you damage your car or your car breaks for any reason and you cannot drive or continue in the school, there will be no refund provided for the remainder of the event that is missed. For example, if you run off the track and break your suspension or if your radiator breaks on Saturday morning at 9:00am and you cannot run any more laps that weekend, you will not be reimbursed for any of your event fees for that event. The National Capital Chapter reserves the right to decline entry to any individual and to any vehicle deemed unsafe or unsuitable for track use. There will be no exceptions made to these cancellation and refund rules. They have been developed over many years of experience operating NCC driving schools. Please do not ask us to make an exception to your 'unique' situation. Thank you for helping us run a safe and financially successful HPDE program. 1. It is the responsibility of the LESSEE to post the rules to any and all online links, and include in any registration packets for the event to be held at Summit Point Motorsports Park. 2. PIT BIKES, ATVs and any other similar type vehicles are restricted to the general paddock area ONLY and are not permitted to be used outside of the paddock or in any “off road” areas of the facility. All operators are required to have a valid license for the vehicle, and no one under 16 is to be permitted to operate any motorized vehicle except as permitted by LESSEE’s insurance during track activities. 3. DRONES or any other remote flying type craft are not permitted to be flown at any time in any area of the property and may be subject to confiscation. 4. Participants of an event at Summit Point Motorsports Park are limited to the circuit, paddock, and general access roads immediately surrounding the circuit where the event is taking place. Absolutely no admission to any other circuit or training area is permitted. Other areas may include ranges, off road training areas, or other circuits which may or may not be in use for other events. 5. Facility Access for participants may be arranged the day prior to an event. Such access will be no earlier than 6 p.m. on the day prior to an event. Should such access not be arranged in advance, access is 7 a.m. the day of the event. 6. Facility Access when moving from one circuit to another on successive days. Should the LESSEE be renting more than one circuit on successive days, transfer from one paddock to the next shall not occur before 7 p.m. of the first day of an event to allow for proper time to clean and make ready the paddock for the event. 7. Sound Limits Summit Point Motorsports Park has a 103dB sound limit. Any vehicle(s) found to be over the sound limit will be removed from the circuit and given time to correct the issue before returning to the circuit. Repeat violations of the sound limit may result in the vehicle not being permitted on to the circuit. 8. Fireworks are not permitted at any time at Summit Point Motorsports Park. 9. Quiet Time No “race engines” or other loud vehicles may be run either on track, in the paddock, or in any area of the facility prior to 7 a.m. or after 7 p.m. Additionally, the Shenandoah Circuit is subject to a “Quiet Hour” for church services in the community from 11 a.m. to 12 p.m. every Sunday. 10. Speed Limits on any and all access roads on the facility is 20MPH and “Walking Speed” within paddock confines. 11. Grills and campfires Participants are permitted to use grills during an event. Campfires are permitted, but we strongly encourage the use of self-contained raised “fire pits” and discourage the use of ground fires. 12. PETS should be leashed at all times and non-aggressive to people and other animals. Owners are expected to clean up after their pets. 13. Children are always welcome at Summit Point and should be supervised at all times. Bicycle riding should be limited to after the track goes “cold” to limit interaction with moving vehicles in the paddock, and riders under 18 should wear protective head gear at all times in accordance with West Virginia state law. 14. Cones used by an event are to be picked up and returned to the cone shed in your respective paddock at the conclusion of the event. Failure to do so will result in a $250.00 fee billed to the club. 15. Spills and Clean Up should be reported right away to maintenance, whether on track or in the paddock. Oil dry used during an event to clean up spills will be billed to the LESSEE at a rate of $15.00 per bag.